The Self-Realization Fellowship Board of Directors is happy to share with you the news that Brother Chidananda has been elected president and spiritual head of Self-Realization Fellowship/Yogoda Satsanga Society of India (SRF/YSS), succeeding Sri Mrinalini Mata, who served in this position from January 2011 until her passing last month. His appointment was made by a unanimous vote by the SRF Board of Directors on Wednesday, August 30, 2017. Prior to her passing in 2010, late SRF President Sri Daya Mata expressed her conviction to Mrinalini Mata that Brother Chidananda should succeed Mrinalini Mata as president and spiritual head of SRF/YSS. Mrinalini Mata confirmed this some months before her own passing on August 3, 2017, and affirmed to the Board of Directors her agreement with Daya Mata’s recommendation. 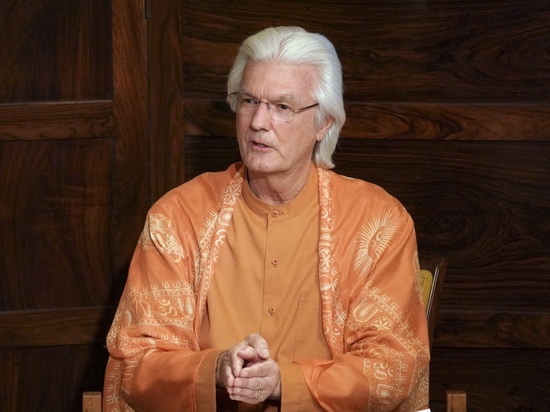 Brother (Swami) Chidananda has been a monk of Self-Realization Fellowship for forty years, and a member of the SRF and YSS Boards of Directors for the last eight years. Almost from the start of his monastic life, he worked closely with Sri Mrinalini Mata, receiving her wisdom-permeated, Guru-attuned training as he assisted her in the editing and publishing of the works of Paramahansa Yogananda and other SRF publications. Born in 1953 in Annapolis, Maryland, Brother Chidananda first encountered the teachings of Paramahansa Yogananda and his Self-Realization Fellowship in Encinitas in the early 1970s when he was a student of sociology and philosophy at the University of California, San Diego. Drawn by a long-felt interest in India’s spirituality, he visited the SRF Ashram Center in Encinitas, just north of the university campus, which was a familiar landmark for many of the students living in the adjacent coastal communities. Some months later, he happened upon a copy of Autobiography of a Yogi and was instantly captivated by the great wisdom and divine consciousness that spoke from its pages. During his last year at the university, he enrolled for the Self-Realization Fellowship Lessons and began attending SRF services in Encinitas. He was deeply inspired by the talks of Brother Anandamoy, who was the minister there at the time, and also benefited from Brother Anandamoy’s personal counsel. It was in this sacred environment—so permeated with the vibrations of Paramahansaji—that he was profoundly influenced by the monks and nuns living there, and the desire to devote his life completely to seeking God and serving the work of Paramahansa Yogananda as a monastic disciple was awakened almost immediately. Brother Chidananda entered the monks’ postulant ashram in Encinitas on November 19, 1977, and spent a year and a half there under the strict and loving guidance of Brother Premamoy, the saintly housebrother in charge of training the young monks. It was Brother Premamoy who first suggested to Sri Mrinalini Mata that she consider taking this young monk into the SRF Editorial Department. In April 1979, having completed his postulant training, Brother Chidananda was transferred to the SRF International Headquarters at Mt. Washington and was immediately assigned to editorial work in the Publications Department, serving under Mrinalini Mata and her co-editor in chief, Sahaja Mata, both of whom had been personally trained by the Guru to edit his writings and talks for future publication. Shortly after the passing of Sahaja Mata in 1996, Brother Chidananda was appointed by then President Sri Daya Mata to the SRF/YSS International Publications Council, on which he served with Daya Mata and Mrinalini Mata until Daya Mataji’s passing in 2010. During this time he assisted these two senior direct disciples with the preparation and publication of many works, including Paramahansaji’s voluminous scriptural commentaries (God Talks With Arjuna: The Bhagavad Gita and The Second Coming of Christ: The Resurrection of the Christ Within You) as well as all other SRF publications released from 1980 to the present. After years of progressively deeper training from Daya Mata, Mrinalini Mata, and Sahaja Mata, he was designated by Mrinalini Mata to succeed her as editor-in-chief of SRF/YSS publications after her passing. Brother Chidananda was given the final monastic vows of sannyas by Sri Daya Mata in 1997. His monastic name Chidananda means “bliss (ananda) through the infinite Divine Con­scious­ness (chit).” An ordained minister of Self-Realization Fellowship, he has shared Paramahansa Yogananda’s teachings during lecture tours and retreat programs in the United States, Canada, Europe, and India—as well as at the annual SRF World Convocations in Los Angeles. He was appointed a member of the SRF and YSS Boards of Directors by Sri Daya Mata in 2009, and has also served for many years as a member of the management committee that oversees SRF’s myriad activities and operations under the guidance of the president. Speaking to SRF monastics after the election was announced, Brother Chidananda said: “It is with humility, and with the consciousness that Gurudeva Paramahansa Yogananda will always be the head of this organization, that I ask the prayers and aid of all of you in seeking to fulfill the request of our beloved Sri Daya Mata and Sri Mrinalini Mata to carry on in their footsteps. Their commitment to being pure channels of Gurudeva’s love—their divine example of seeking to attune every thought, decision, and action to his will and guidance—has been my inspiration throughout my life in the ashram; and it is with a sense of that sacred responsibility that I look forward to serving this great work of God and Gurus in the years ahead, trusting in the help, prayers, goodwill, and divine friendship of you all.